All lovers of nature have their favourite wild places. I’ve written about some of mine in other pieces – many are in the north of England or in the Eastern Pyrenees, which are the areas we tend to walk in most, or on the windswept coasts of East Anglia. But it’s important to have wild places nearer to home, and one of my favourites is the area around Nine Wells, just south of Addenbrooke’s hospital on the edge of Cambridge. All wild places are full of surprises. One early spring afternoon a fox sauntered down the field from White Hill, crossing the track about 20 metres in front of me – the wind was behind me so it must have been aware of my presence. And just recently I watched a marsh harrier languidly quartering the largest field for half an hour. Forty years ago just a single pair nested in Britain, and although there are now over 300 pairs across the country they remain a rare sight away from the coastal marshes. But for me the stars of the area are the birds of arable farmland. When I was a child, these were the numerous and everyday companions of spring and summer. Singing skylark (right) were my first sign of sign of spring, while yellowhammer and corn bunting reeling away across the ripening corn were the very essence of summer. 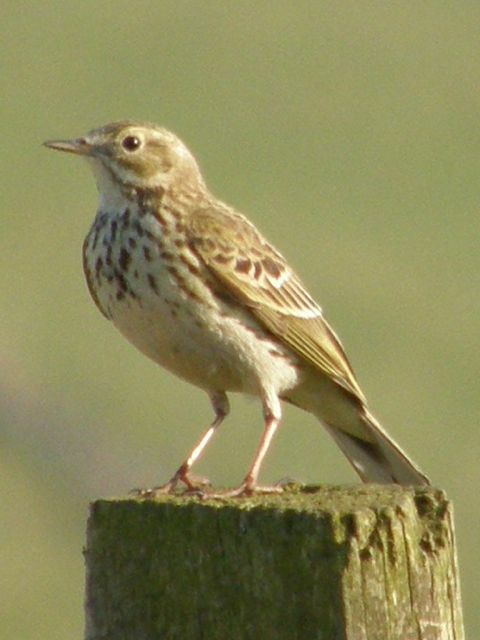 These birds, which were then so common, have suffered catastrophic declines: we have lost 90% of our corn buntings and grey partridge since 1970, and half of our skylarks, yellowhammers, linnets and yellow wagtails. 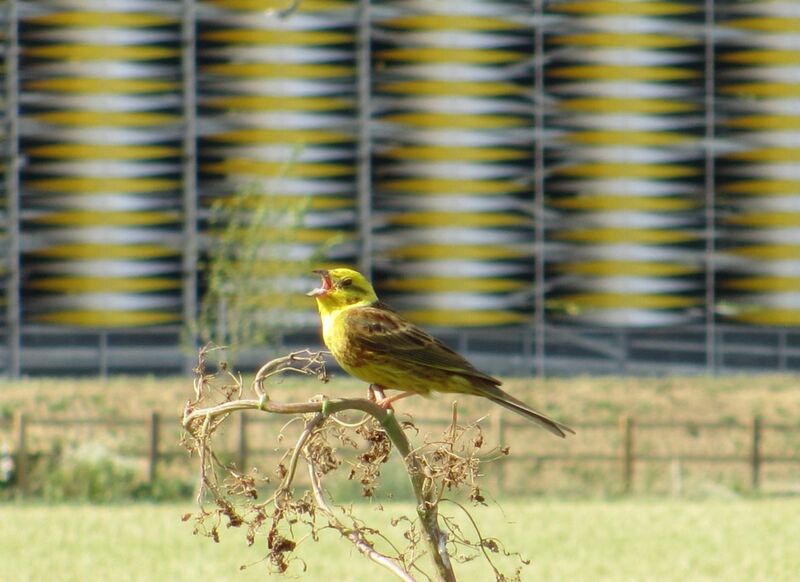 Yet around Nine Wells their numbers are remarkable – this year there are over 20 pairs of skylark, 10 pairs of grey partridge, almost as many linnets and yellowhammers and a couple of pairs each of corn bunting and yellow wagtail. One warm summer’s day I sat for a while looking up at White Hill, with a corn bunting singing behind me and a yellow hammer in the hedge to my left. Partridge (below) chuckled among the peas growing in front of me, while overhead dashed swallows, house martins, swifts and ‘parcels’ of linnets. 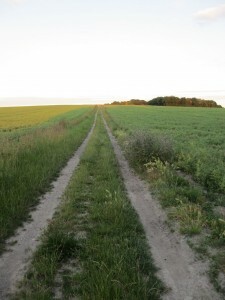 I worry that this area – currently designated as green belt – may be released for development. 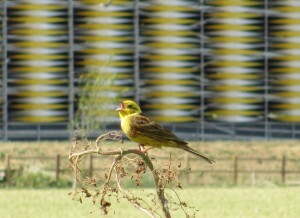 Already the ever-expanding Addenbrooke’s is growing inexorably towards it – on the right is a yellowhammer singing in front of the new hospital car park – while over the railway line the new Great Kneighton/Clay Farm development emerges. To remind those who decide such things how valuable the area is for farmland birds I carry out an annual survey of the area. Here is my report for this year – please do download and share. This entry was posted in Nature, Walking by user29464. Bookmark the permalink. I love the music and can’t wait to take a look when I get home.